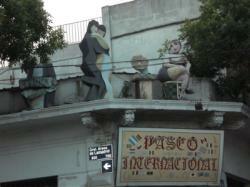 Walking in the city of Buenos Aires is visual entertainment. From street scenes of tango dancers and stands of arts and crafts to breath-taking architecture, the city delivers significant sights to see. A personal favorite are the graphics, from advertising to murals and window dressing. The city is a unique combination of the First and Third world and of Latin and European influences. 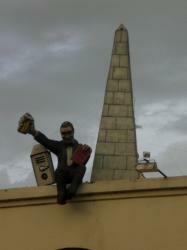 This mix shows through in its signs and symbols that seem to complement the city’s culture. 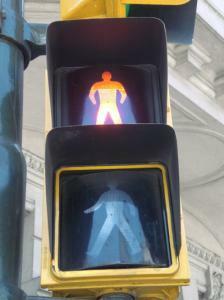 Even the figures in the “walk/don’t walk” signals have there own personal style, with a more robust, macho look than their North American counterparts. Maybe it’s the steak? 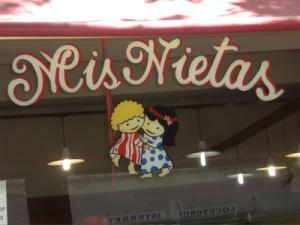 This restaurant in San Telmo “Mis Nietos,” or “My Grandchildren” is an example of the charming, original window dressings that help make this historic neighborhood special. The artistic spirit of San Telmo draws tourists and locals alike and it’s the small details that add to afternoon strolls. 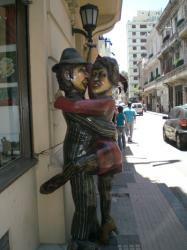 Colorful figures in San Telmo and La Boca add a festive vibe to the city streets. These tango dancers, and the man with stein in hand above a cervezaria, manage to catch the eye without being overly kitsch. The same can’t be said for all of the figures, especially those on a balcony in La Boca that seem to represent the inhabitants of a bordello. A vibrant, creative culture shows through in signs, murals and advertisements. From the homemade and artistic to the commercial and garish, however you paint it, Buenos Aires is anything but dull and commonplace. Interesting post! You’re soo right. 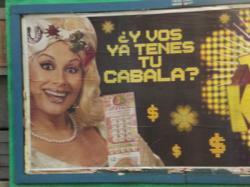 Dull and commonplace are the last things I would call Buenos Aires. I hope I’ll have the opportunity to travel to Argentine soon. This page rendered in 0.079 seconds.